Leeton Roxy Community Theatre. Photo courtesy of Leeton Shire Council. 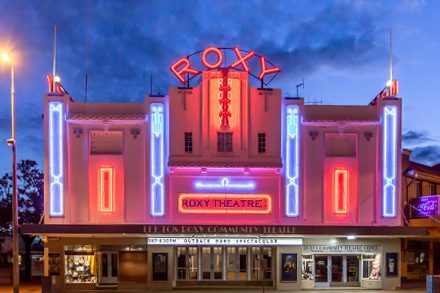 Arts and cultural infrastructure projects in towns and cities across regional NSW will benefit from a share in $47 million available through round two of the State’s Regional Cultural Fund. Funds have been awarded to 56 regional cultural infrastructure projects, including for regional public library infrastructure projects as well as support for the creation and installation of artist-led public art. The Fund’s first round announced in May 2018 saw 68 regional projects share in $48m in funding. Administered by Create NSW, the Regional Cultural Fund falls under the NSW Government’s $1.6 billion Regional Growth Fund that aims to improve economic growth and productivity, and community amenity, with investment in regional communities. Executive Director, Create Infrastructure Craig Limkin said a small, dedicated team within Create NSW had worked tirelessly with regional arts and culture organisations to encourage and support them through the funding application process. “Strategic investment in arts, screen, culture and heritage adds vitality to local communities, provides artists with new opportunities to showcase innovative and quality works and allow visitors to experience a diverse range of arts and activities while generating social, economic and tourism benefits across the state,” Mr Limkin said. Find out more about the Regional Cultural Fund. See the full list of Regional Cultural Fund Round Two recipients here.